Looking for a little more out of your SUV? INFINITI has your answer. With INFINITI QX80 pricing, you can join other drivers in Mandeville, LA, and enjoy a luxurious ride with a host of enjoyable features. On top of this, you’ll have a spacious interior and the reliability you need in an everyday vehicle. There’s plenty more you’ll love about the QX80, so get to your local dealership and test-drive a model today. If you’re like most shoppers, you purchase an SUV for off-road adventures and to help you accomplish your daily tasks. You need a state-of-the-art engine to make this happen. As you research INFINITI QX80 pricing and the vehicle’s features, you’ll love what you see in the 5.6-liter, 32-valve, V8 DOHC engine. It’s powerful enough to get you up steep hills and across the toughest terrain—and then some. It generates 413 foot-pounds of torque at 4,000 rpm and 400 horsepower at 5,800 rpm. With specs like these, the QX80 has few rivals. If you head out of town for fun or for your daily activities in Mandeville, LA, you want an SUV that provides ample storage space for outdoor gear, sports equipment, groceries, luggage, and more. Inside the QX80, you’ll have a maximum cargo capacity of 95.1 cubic feet to work with. Even with all the seats in place, there’s still 16.6 cubic feet of cargo capacity. It has an EPA interior volume of 167.9 cubic feet as well. As for pulling other vehicles and hauling heavy loads, the QX80 acts like a truck. It has a maximum towing capacity of 8,500 pounds and a maximum payload of more than 1,600 pounds. You know about the mechanical capabilities and storage space, but there are also innovative comforts to make your ride more enjoyable. You’ll want to take advantage of INFINITI QX80 pricing knowing that this SUV has elements such as three-zone climate control, power steering, cruise control, dual-illuminating vanity mirrors, turn signals in the mirrors, and seatback storage. You’ll also make good use of the front, side, and rearview cameras, not to mention the parking sensors. The leather steering wheel is even heated. 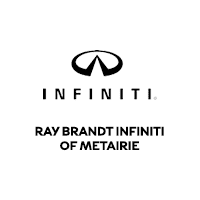 For your first look at INFINITI QX80 pricing, head to Ray Brandt INFINITI. Here, the team will help you find the right model that you can drive each day in Mandeville, LA.